Toss the butternut with 2 tablespoons of olive oil in a bowl. Season to taste with salt and pepper, and arrange evenly onto a baking sheet. Bake in the preheated oven until the butternut is tender, 20 to 25 minutes. Meanwhile, heat the remaining 1 tablespoon of olive oil in a large skillet over medium heat. Cook the onion until it starts to caramelize, and then add the garlic slivers. Continue to cook while stirring until golden brown, at least 15 minutes. Stir in the kale, cooking until wilted and tender – it only takes about 3 minutes. Transfer the kale mixture to a bowl, and cool to room temperature. Once all the ingredients have cooled, mix the apple cider vinegar with a bit more pepper and the thyme. 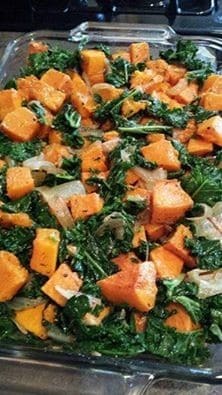 Then combine the butternut, kale, and vinegar mixture in a bowl and gently stir to combine. You could use yams instead of butternut, and any type of vinegar you prefer.